FresherAcc Is Our Exclusive Brand And We Are Continuously Looking For Elegant Design to Match With An Idea Life! Finally We Get This Bling Statement Hollow Hoop Band Compatiable for Apple Watch Combines With Great Ventilation and Light Weight. It Is not Only One Mediocre Compatiable Apple Watch Replacement Strap but Turning Your Watch to A Fashion Jewelry Bracelet Immediately, Functional and Stylish! Material: Eco-friendly Coating Based On Brass , Stainless Steel Adapter, Unique Easing Opening and Closing Clasp. Package included:1 x Compatiable Apple Watch Band, 2 x Extra Clasp. (No Watch included). 45 Days Warranty, 24 Hours Online Quick-replies if You Have Any Questions. The Fresher Team Sincerely Wishes To Provide All Clients With Products Of Better Quality, Better Service And Better Shopping Experience. Statement Hollow Hoop Cuff Compatiable Apple Watch Band. Filigree Cut-Out Floral Pattern Features A Smart Glitter iWatch Replacment Strap, Light Weight but Very Modern Tone for Your Chic Watch! Unique Wrist Ergonomic Design, Elegance and Comfortable Fitting Your Wrist, Stainless Steel Adapter Locks Your Watch Interface Precisely and Securely, Colors Matched with Series 1, 2, Sport Edition, NIKE+ & Hermes. Folding Clasp for Simple Length Adjustment, Opening and Closing Easily, Length Changed In Seconds By Hand Only, Two More Extra Clasps Provided Free, Fits Wrist Size From 5.9" - 7.5" (150mm-197mm). For More Extra Clasps, Pls Search "FresherAcc", Need to Be Bought Separately, So Pls Do Not Forget to Measure Your Wrist Before Purchasing. Coming With Gift Box, Perfect Gift for You Or Beloved, 7*24 Customer Passionate Service Provided, Longtime Warranty, 45 Days Money Back Guarantee or Exchange Without Reason. Notice: Please Ensure You Choose "Sold by FresherAcc" for Guaranteed Quality. We Are the ONLY Authorized Retailer of Our Brand. 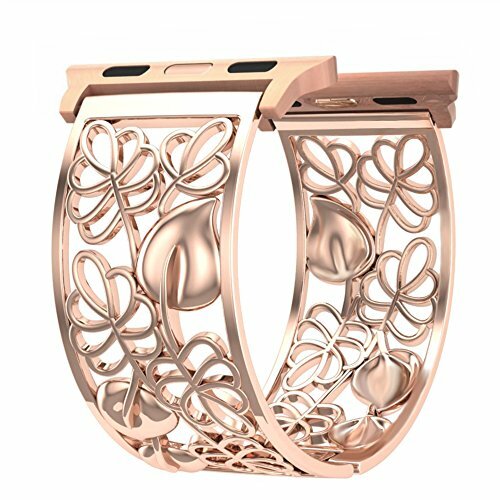 Gorgeous Jewelry Compatiable iWatch Band, Plated by REAL Rose Gold, Close to Apple Watch's Rose Gold, But Not The Same, Keeping It Dry and Avoid Water Flushing Like Bathing, Washing Hands and Swimming, Perfume Is Also Corrosive to It, Please Wear Your Perfume Before Putting on, Clean It With Soft Fabric Comes With. If you have any questions about this product by FresherAcc, contact us by completing and submitting the form below. If you are looking for a specif part number, please include it with your message.